Reason 1: I have sent a family tree proving that I and my cousin are related, he's from the family household so technically my father is his uncle and I am his cousin,but he's way older than me so on the invitation letter he referred to me as his nephew , still this is completely irrelevant because they could've called me or him and they'll easily see that I'm technically his cousin but the age gap (I'm 21 and he's around 57 which a copy of his passport that I provided shows) makes it completely obvious that is not a reason for a refusal! 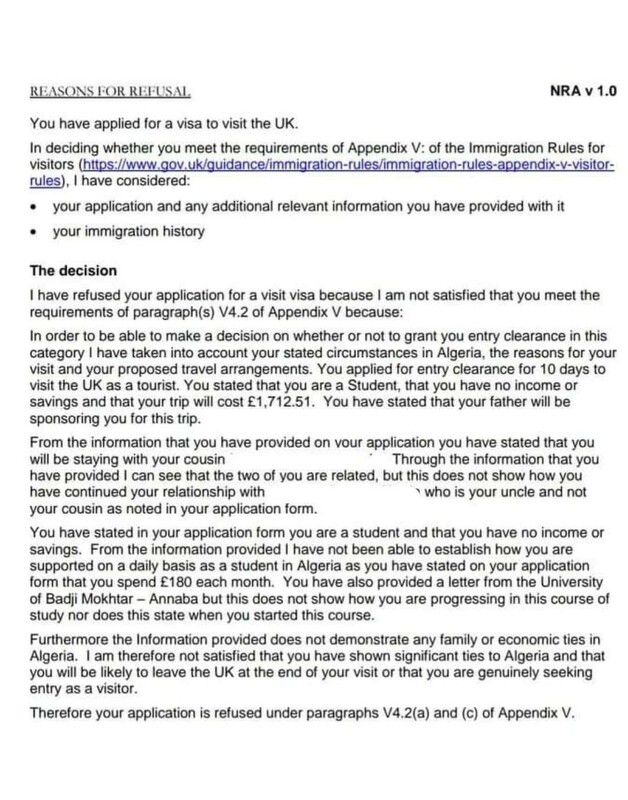 Reason 2: I have said in the application form that I spend 180£ as a student which I neatly calculated and it is this low because DZD(Algerian dinar) to GBP is so disproportionate and I've mentioned that I live with my family AS THEY ASKED ME in the application so the cost of living for me is to be way too low in comparison with a student that lives alone. Reason 3: I have provided a certificate of registration + a certificate of scholarship that I received from the university administration, that should be enough to prove that I am indeed running courses and exams, why would they suspect something like this ? I am not some fool that will try to lie about what I'm doing, I worked hard to be in this speciality(med school) and I'm not willing to live as an out-law in some cold country! Reason 4: I have provided tremendous amount of financial circumstances about everything that you can possibly think of and this is the final nail in the coffin that this refusal letter is completely biased, and if you think that I'm lying please do ask for pictures of the translated documents. If I can't be convinced that this is a legit refusal letter and not some bad joke, my uncle(TECHNICALLY COUSIN) said that he will sue them for being so unfair. If it is because of the current state (political) of the country then they should've mentioned it because everything is going all well for now and we will not destroy our country like others did by military brute force or taking arms against the government, Algerian people did it in the 90'ees and they paid it with their blood and wont redo it, therefore i'm not seeking to overstay at any country I wish to visit. From your question and other information you’ve provided in comments, if you reapply you can probably fix the deficiencies around your relationship to your cousin and your educational ties by providing better evidence to address the points raised in the refusal letter. What you can’t do quickly is overcome the discrepancy between your statements in the application that you have no income or savings, but spend £180pm. This information is contradictory, and UKVI don’t understand how the two ‘facts’ can both be true. You’ve said in your comments that this money comes from your father in cash as and when you need it. So the answer to ‘what to do’ (although it clearly won’t be what you want to hear), is improve the evidence relating to the other refusal reasons and start getting your cash allowance paid from your father’s into your bank account. Wait until you have at least 6 months’ statements demonstrating this before you apply again. Do not be tempted to reapply immediately with a different monthly spend figure - that’s a recipe for disaster. UKVI will refer back to your first application and ask themselves whether you are massaging the figures to increase your chance of success. IMHO, given that the refusal reason relating to the £180 was factually correct there is very little, if not no, point in lodging a complaint in an attempt to get this decision overturned. Not the answer you're looking for? Browse other questions tagged uk visa-refusals standard-visitor-visas uk-citizens or ask your own question. What should I put down for “Reason for refusal”?